Everyone (ok, almost everyone) who follows me on Facebook have possibly already seen this photo when I shared it to our youngest daughter Melissa last Friday. But I offer no apologies for sharing it again. Of all the photos I took last week, none came even close to the spectacle of this one. 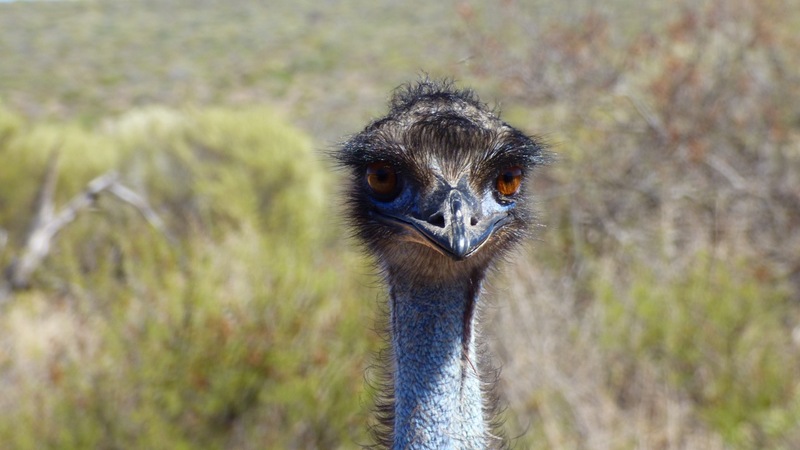 Quite frankly, I’m amazed, not only by the detail I captured, but also by the incredible portrait of the emu. Click to enlarge and look into his big, beautiful, brown eyes. This proud father was escorting his mob along the road and we slowed to allow them right of way, thinking they would simply ‘step aside’ and allow us to pass, and while some of the youngsters did, dad had every intention of checking us out to make sure we weren’t a threat. He walked right over to the car, Dean wound down the window, and I grabbed the camera – naturally. that is an awesome photo. It made me grin and laugh out loud! Thank you Nancy. He made my heart skip when we came over to the car window.